Curlies were first discovered by white men in America in in the wild herds of mustangs in Eastern Nevada, at the turn of the 20th Century. The Sioux and Crow Indians had Curly Horses as early as 1800, though whether these two kinds of Curly Horses were related we don't now. In fact "Curly haired Horses" were found at various times in various places round the world - Charles Darwin writes of curly horses in South America, for instance, and a lot of further image documents give evidence for such Horses. 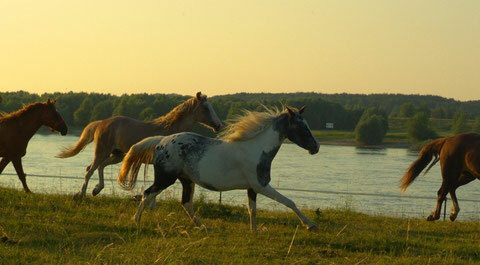 Again, whether these horses are at all related to the American dominant gene Curly Horses is unknown at this time. Hopefully future research will shed some light on these matters. The Damele's, a Nevada ranching family, were the first to gather and use the Curlies on their ranch, in the 1930s. 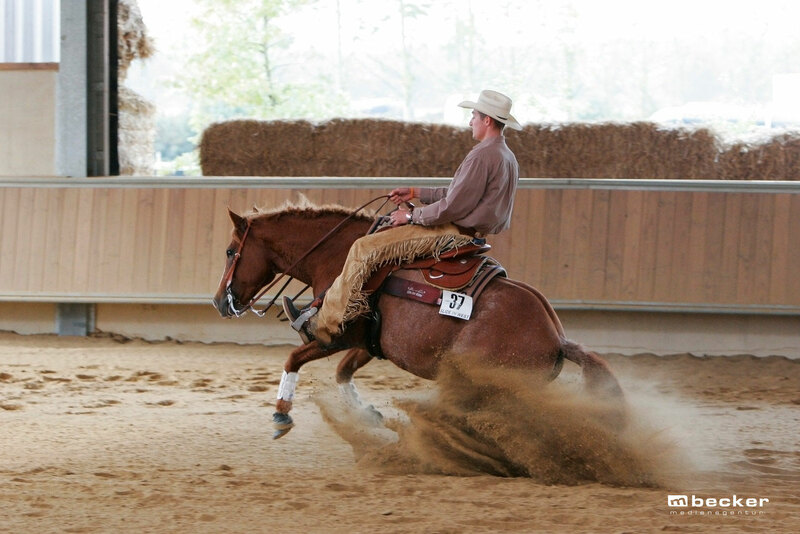 They interbred the tough, intelligent range Curlies with their ranch horses, and with an Arabian stallion, Nevada Red, and later a Morgan stallion, Ruby Red King. They found out that the Curly coat was mostly preserved with the crossedbred horses. That proves that the Curly gene was a dominant in these horses. They also frequently got the other Curly characteristics which they prized - strong bone and hooves; calm intelligent easily trainable temperament; friendly personality; tough constitutions and stamina, frugality and to feed easily . They are happy with grass, hay and water. Curlies come in a variety of sizes and shapes, and almost all colors. The winter curls on different individuals can range from crushed velvet looking, to marcelle waves, to tight ringlets, to "French knot" micro curls. Manes and forelocks can be corkscrewed, ringletted, or dreadlocked or rasta manes. Tails may have some wave or curl. 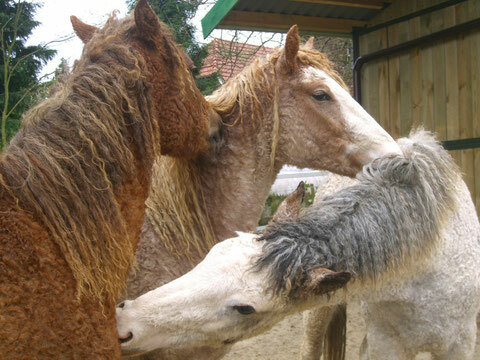 The hair in their ears is curly, the eyelashes are bent upwards, and fetlocks are often curly or wavy. 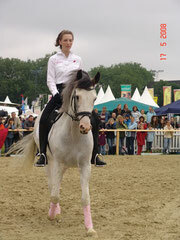 These curls are considered a hallmark of the breed. Especially conspicuous is the smell of these individual horses, they don't smell typical of horses, but they smell of pure wool more likely of lamb wool. The coat is very containing tallow and also the cleanest Curly Horse causes tallow deposit at the hands while being stroked. But also when the ancestors were generally curly, foals can be born with a fur not curly and without the typical hallmarks. But the loss of the curls is apparently the only genetic divergence, for they mostly preserve their hypoallergenic coat as well as their unmistakable character traits. The original Curlies were used by white men for ranch work, and by Native Americans for buffalo hunting. There is evidence the Native Curly owners considered their Curly "Buffalo Horses" to be sacred. 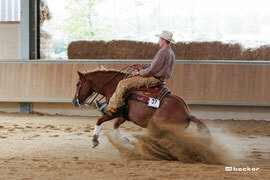 Today, Curlies are used as sport horses (dressage, jumping, combined driving, etc. ), western and ranch horses, pleasure horses, being especially sure footed in the terrain, trail horses, endurance horses, and exotic looking pasture ornaments! There has been some gaited blood mixed into some Curlies, and about 10% Curlies will do either foxtrot or running walk or stepping pace. This is a natural low stepping smooth gait. 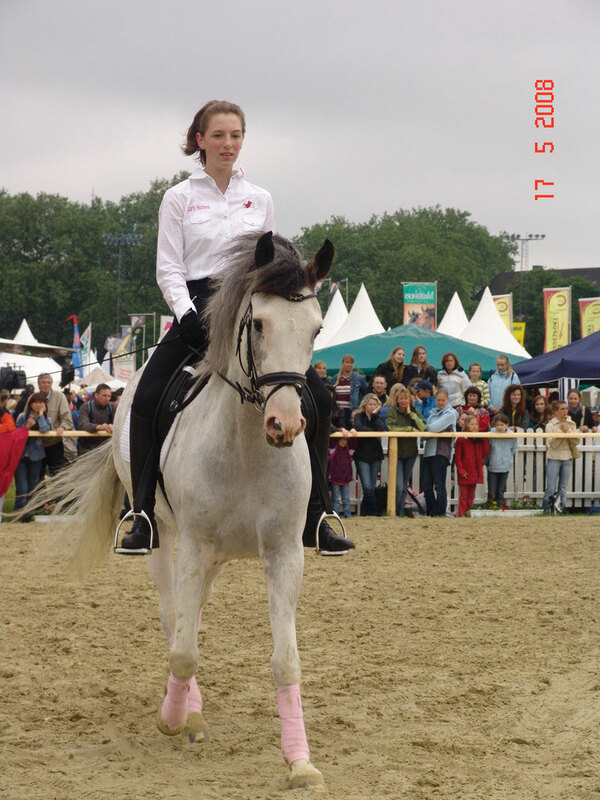 The sports type, carthorse-type and especially the Quarter Horse-type (western horse) are the most frequent breeding orientations. Most people who are allergic to horses can tolerate Curlies with little ore no allergic reaction- a dream come true for a variety of horse-allergic patients. Hypo- means, by definition, below normal. We claim that Curly Horses are Hypoallergenic. 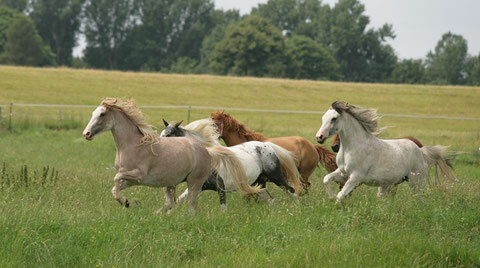 We do not, and can not, claim that Curly Horses are Non allergenic. 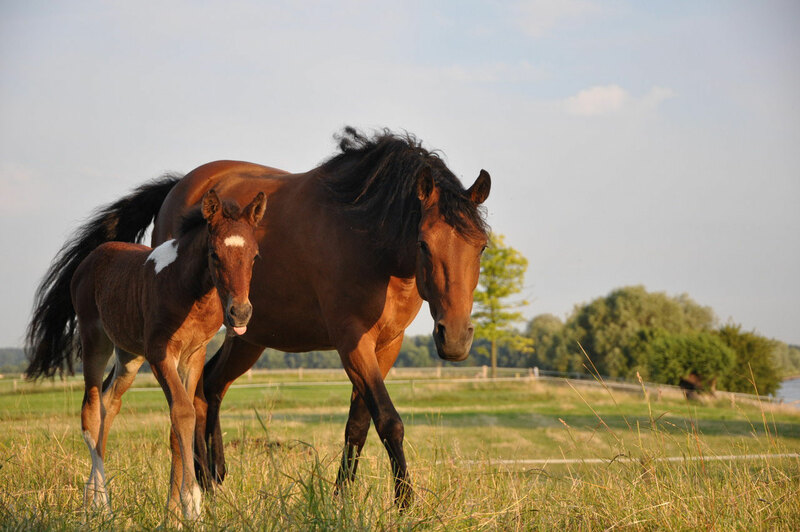 If you are considering purchasing a Curly Horse that you will not be allergic to, we recommend testing your reaction to any given horse you might be considering, and consult with your allergist for the best and safest way to do this. For people who are dangerously allergic to horses, we highly recommend doing any testing in the presence of your allergist. Of course the direct contact shouldn't cause any trouble. Moreover should be out of question that hay, straw, pollen, dust, manure, etc. are the cause for allergic reactions. Curlies do not need pampering, but they do need good basic care. Since they are a horse that developed in the wild, they tend to be easy keepers. Their robust nature, their tough hooves and their special coat let them well survive any hardships also outside in the cold winters. This does not excuse lack of care, though. Good food in the right amounts, adequate shelter, regular veterinary care, worming, hoof trimming and shoeing as needed, dental care, etc., all should be provided just as they would be for any other horse. Normal grooming is satisfactory for most Curly coats. The combing out the ringletted or corkscrew or dreadlocked manes is sometimes almost impossible.Tails can be brushed and combed in normal manner. Care must be taken during shedding season, not to pull out too much mane and tail, during grooming. Some Curlies will shed out their manes and tails along with their winter coats each spring and grow them back in the fall and winter. A few Curlies have very thin or scanty manes and tails year round - why is uncertain, and research is planned in this area. Important for this gregarious breed is the owning close to nature. If possible within a herd, however at least in groups of two a lot of run should be ensured. Natural free population or a shelter is enough protection. These endearing horses express their thanks with healthiness and contentedness for modern open staple owning with a big pasture and free haystacks (small pollution of pollen and dust).